First you drive an hour east of Amsterdam past green fields and creamy cows, sharp industrial parks, and ever-changing speed zones. 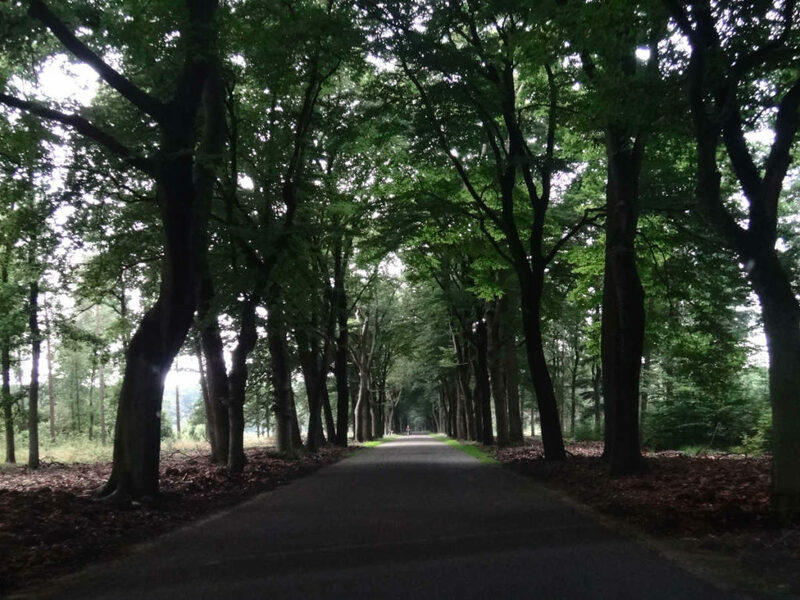 You arrive in the dense Hoge Veluwe National Park and abruptly stop at a gate with a small tourist booth. Believe it or not, you’ve arrived at the second largest collection of Van Gogh paintings in the world: The Kroller-Muller Museum. A canopy of trees leads you to the the Kröller-Müller Museum, Otterlo, the Netherlands. The gate keeper explains that you are in a national park and that while your Museum Kaart gives you free admission to the museum, you have to pay 9 Euros for admission to the park (the museum is in the middle of the park) and 6 Euros to drive into the park. You can save the parking fee by parking at the gate, borrowing one of the free white bicycles, and peddling four kilometers to the museum. 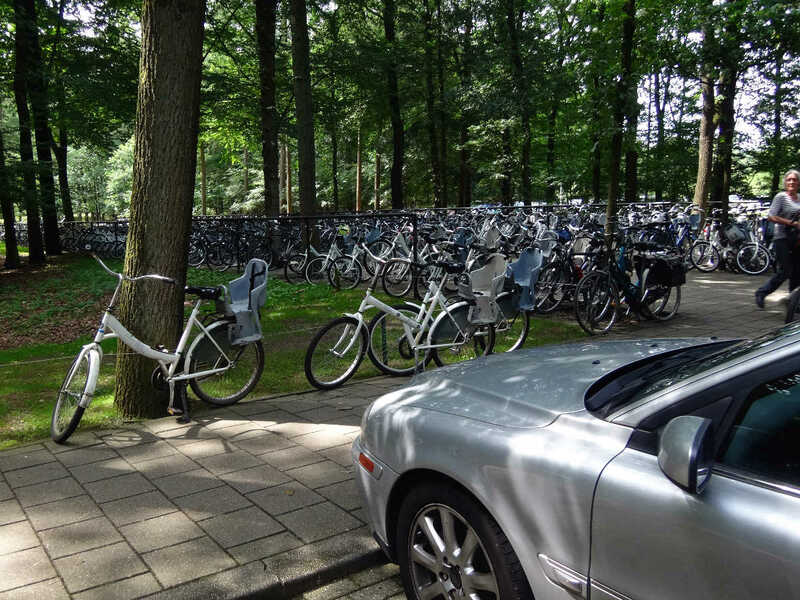 We chose to spend the six euros and drive the four kilometers into the park but you can see that many, many people chose to ride the park’s free bicycles into the De Hoge Veluwe National Park. 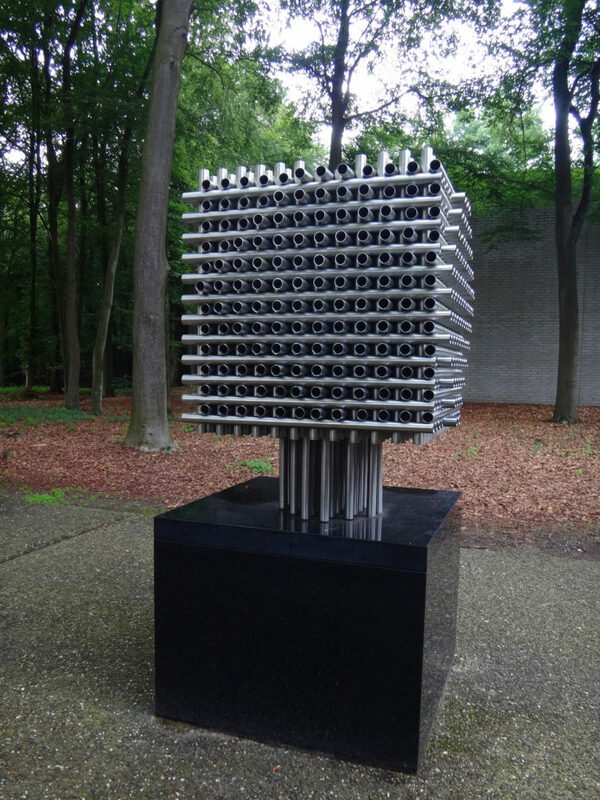 Kroller-Muller Museum, Otterlo, Netherlands. It turns out the 4-kilometer drive into the park follows a pretty but circular route through the forests with a stop at the museum. When you leave it’s only about 1/2-kilometer back to the main gate. So it’s an easy walk or peddle to the museum if you go backwards from the gate rather than follow the long, circuitous route prescribed. The museum, itself, is sleek, a modernist’s dream nested into a rich, green sculpture garden. 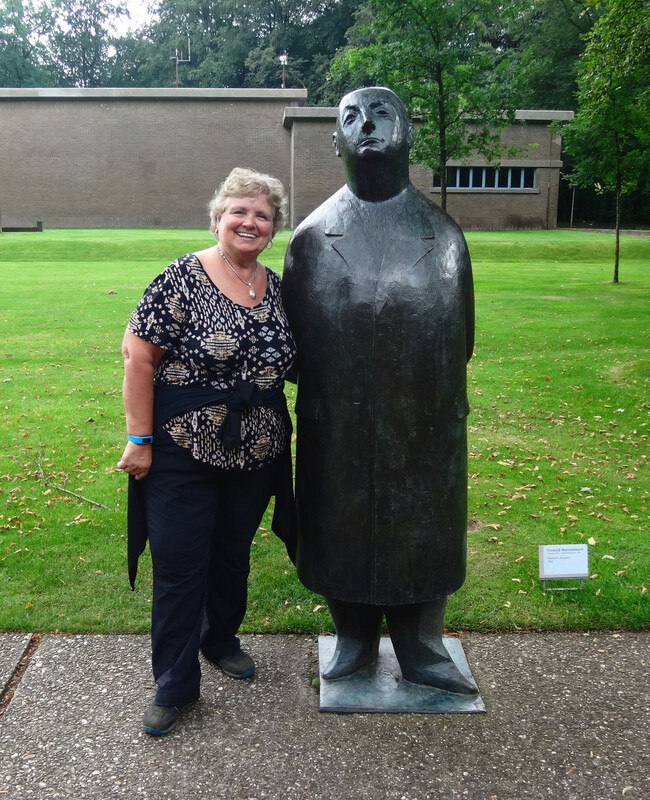 Meneer Jacque greeted me in front of the Kroller-Muller Museum. 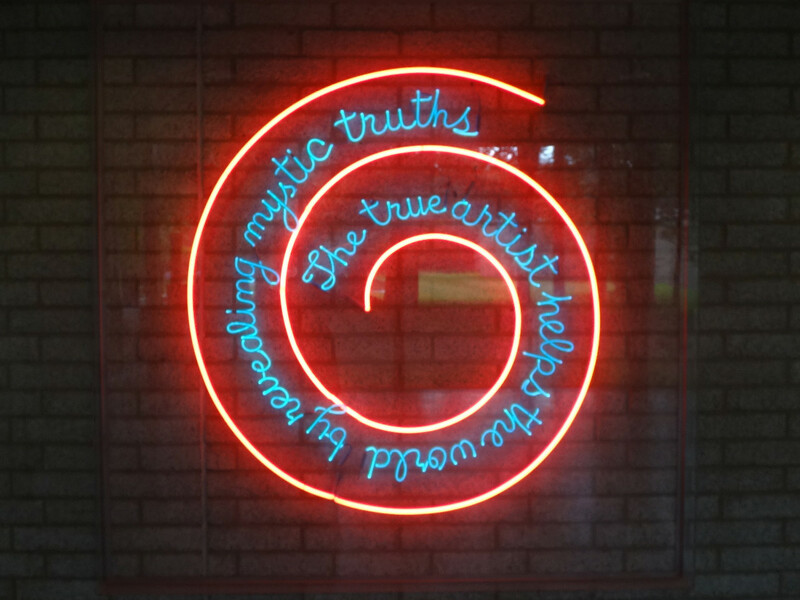 The sculpture gardens are located behind the museum but you get a taste of the art as you approach the front door. Piet Siegers’ 1979 Landscape. 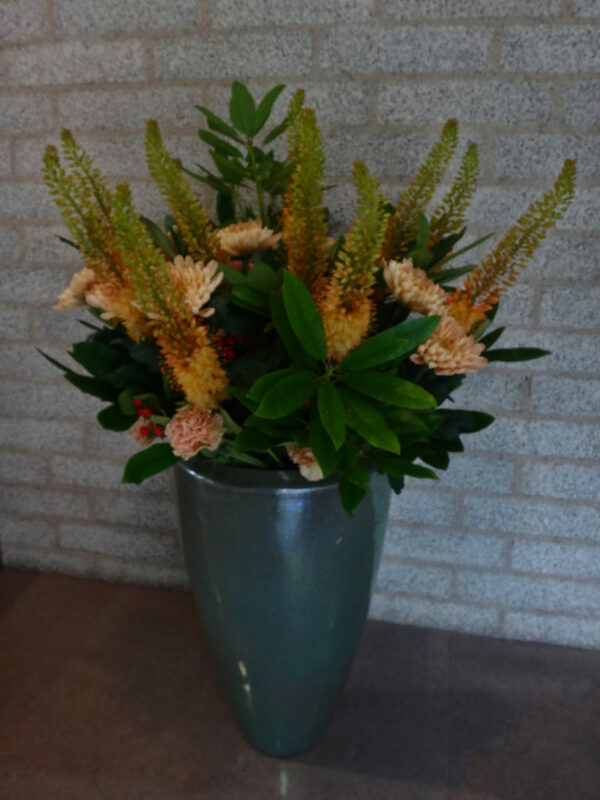 Kroller-Muller Museum, Otterlo, Netherlands. 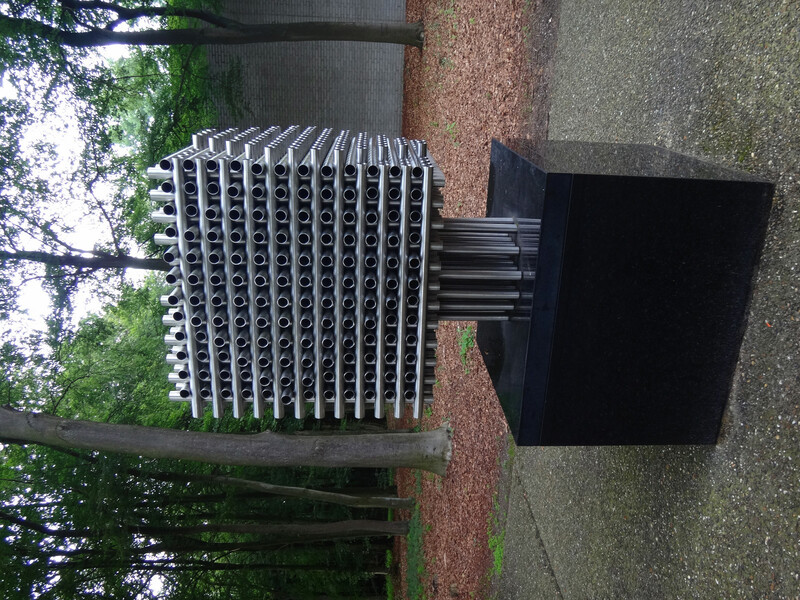 Andre Volten’s 1968 sculpture. 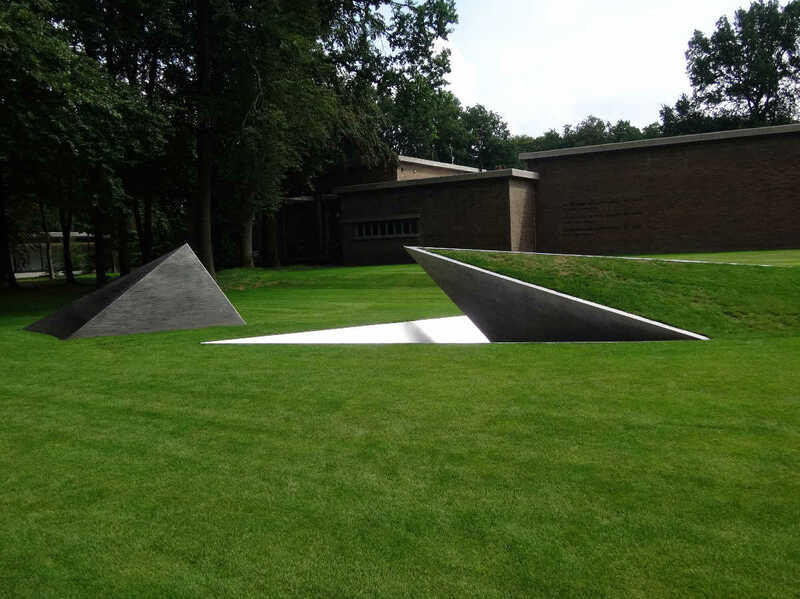 Kroller-Muller Museum, Otterlo, Netherlands. You’ve arrived! 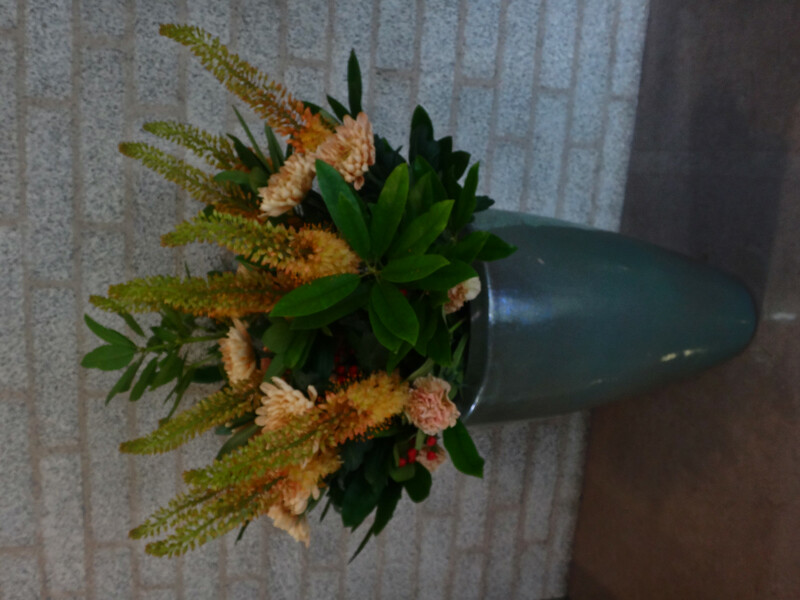 Kroller-Muller Museum, Otterlo, Netherlands. The inside of the museum is just as beautiful as the exterior with clean, fresh lines and – unusual for most museums – lots of seating. Inside the museum.That’s a Calder hanging from the ceiling, Henry Moore peeping over the wall and fresh flowers in the foreground next to big, empty benches. Kroller-Muller Museum, Otterlo, Netherlands. These are a few of the paintings Van Gogh created as he studied the local field workers. He was interested in how they worked and how they moved but he did not fill in or closely detail many of their faces. He was more interested in the light, the color, the motion of the moment. 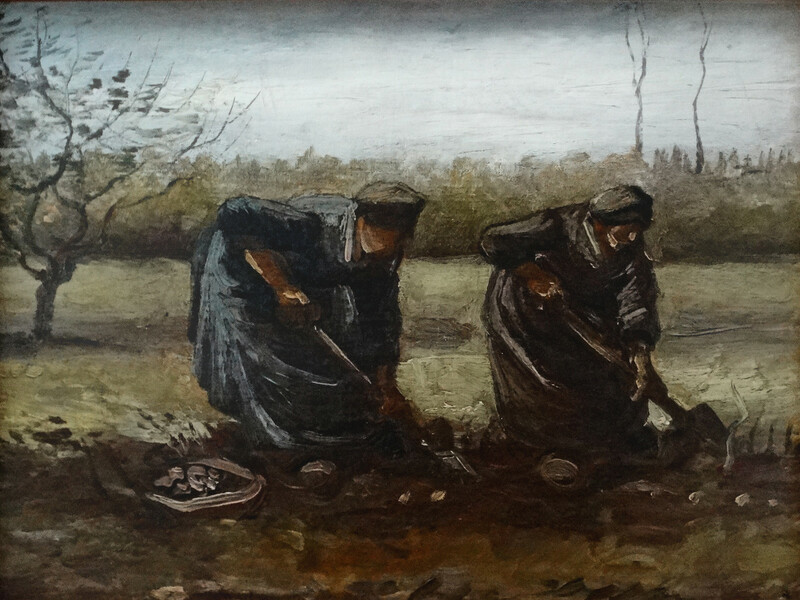 Peasant Women Digging up Potatoes, 1885, by Vincent Van Gogh. The Kröller-Müller Museum, Otterlo, the Netherlands. 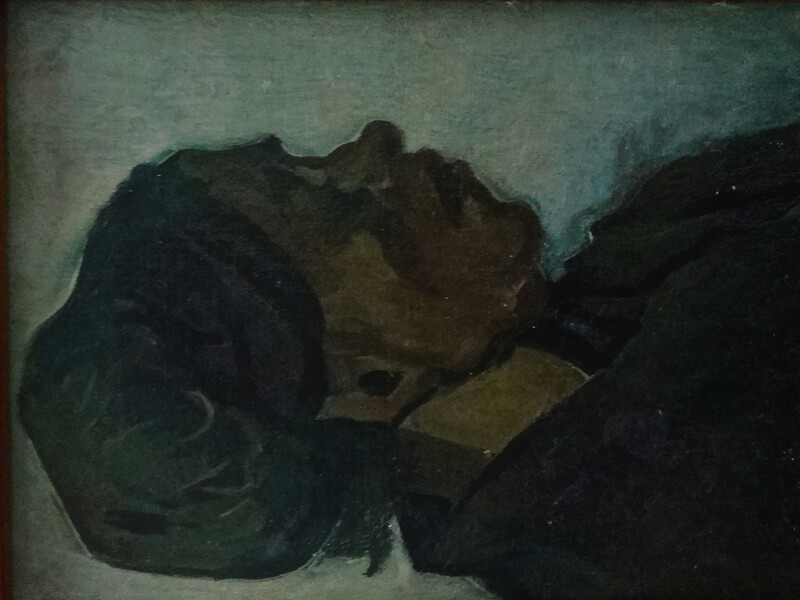 Head of a Woman, 1885, by Vincent Van Gogh. The Kröller-Müller Museum, Otterlo, the Netherlands. 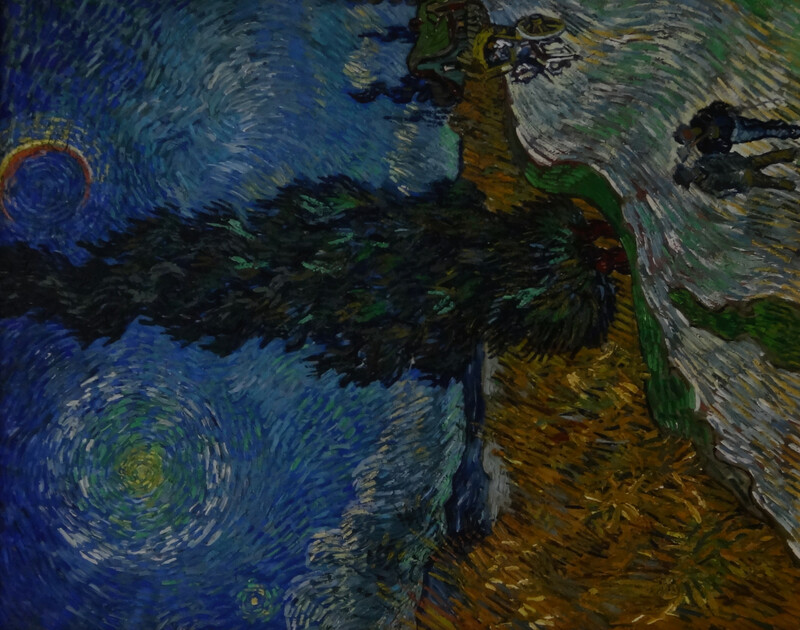 And here is Van Gogh’s masterpiece. 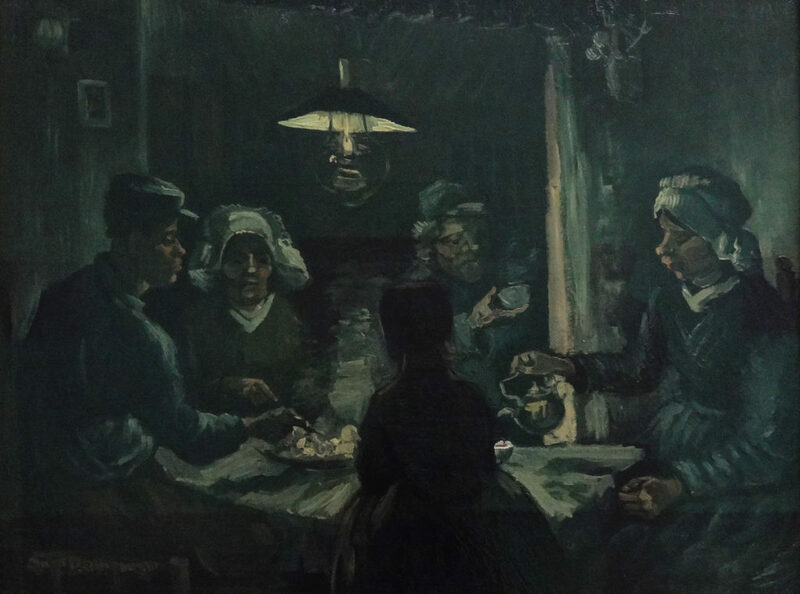 The Potato Eaters, Vincent Van Gogh, 1885. The Kröller-Müller Museum, Otterlo, the Netherlands. 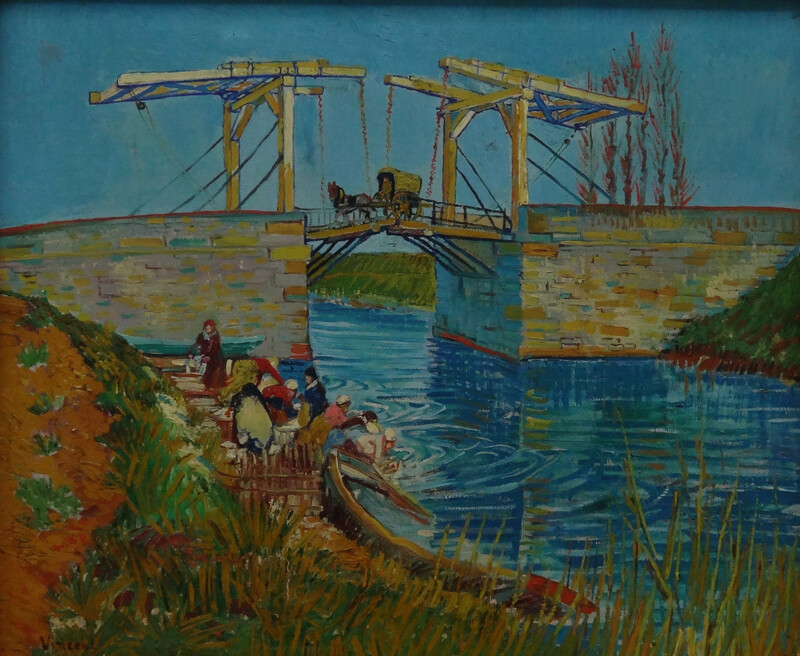 I know you are reading this because you are interested in Van Gogh – and there are more photos at the bottom of this blog. But so many other greats are featured at this museum! The best part of viewing paintings at the Kroller-Muller is that there are not hordes of people crowding around a tiny painting. 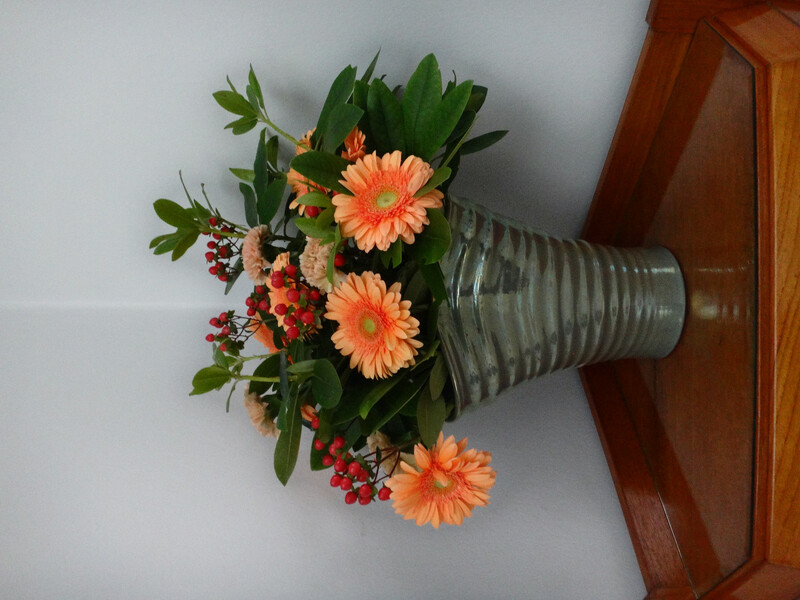 You don’t feel pressured to move on after three seconds (think The Mona Lisa in the Louvre). You can almost smell the paint as you take a side-ways look at the artist’s brushstrokes and a guard doesn’t come running up to tsk-tsk you away. 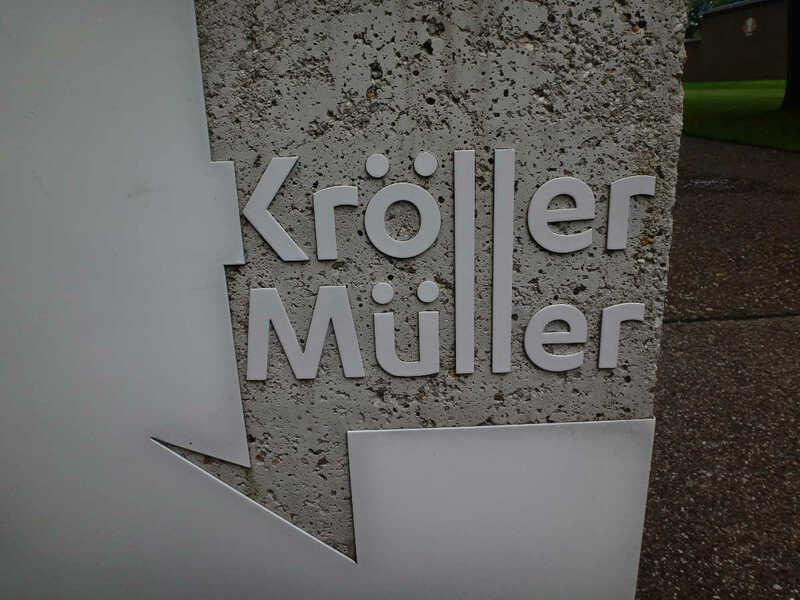 Visiting the Kroller-Muller is an extraordinarily delicious experience! 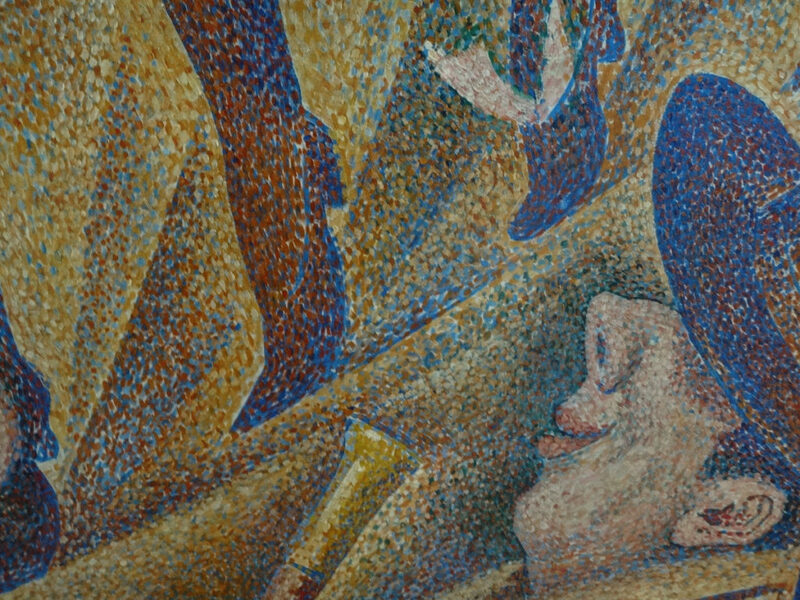 Here’s Georges Seurat’s La Chahut, a neo-impressionist artwork that Seurat created using the pointillist technique of painting with tens of thousands of dots of paint. Close up you might only see pink or green but at a distance, the colors blend and you’ll see brown. 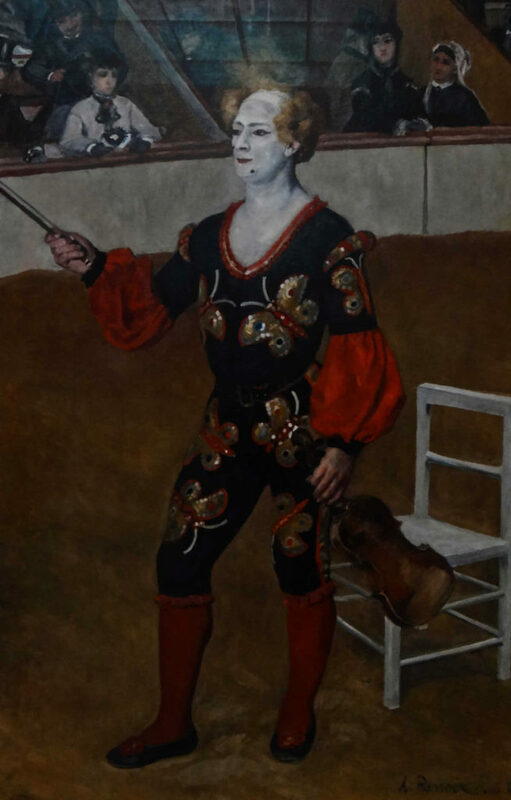 This painting was a huge hit when it was introduced in Paris in 1890. 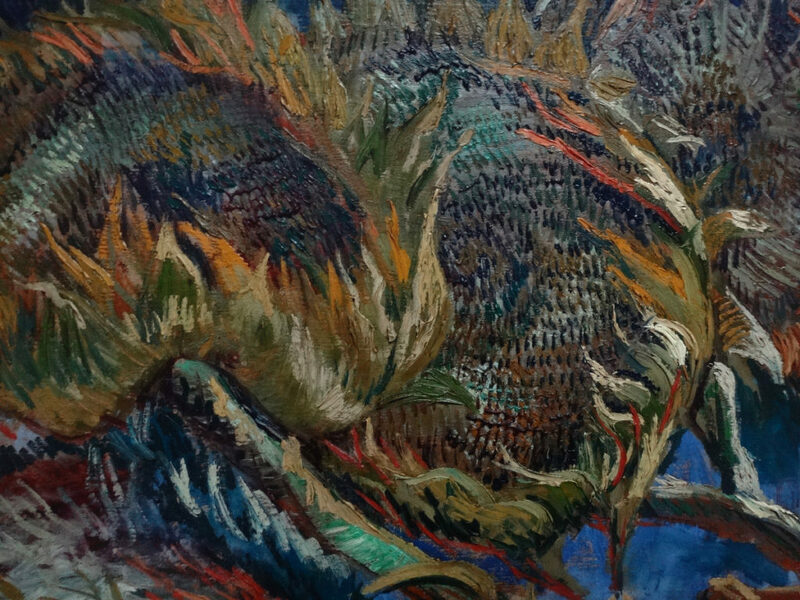 It led the way for new art movements such as my daughter Christie’s favorites, the Fauves. Georges Seurat’s La Chahut, 1889. The Kröller-Müller Museum, Otterlo, the Netherlands. 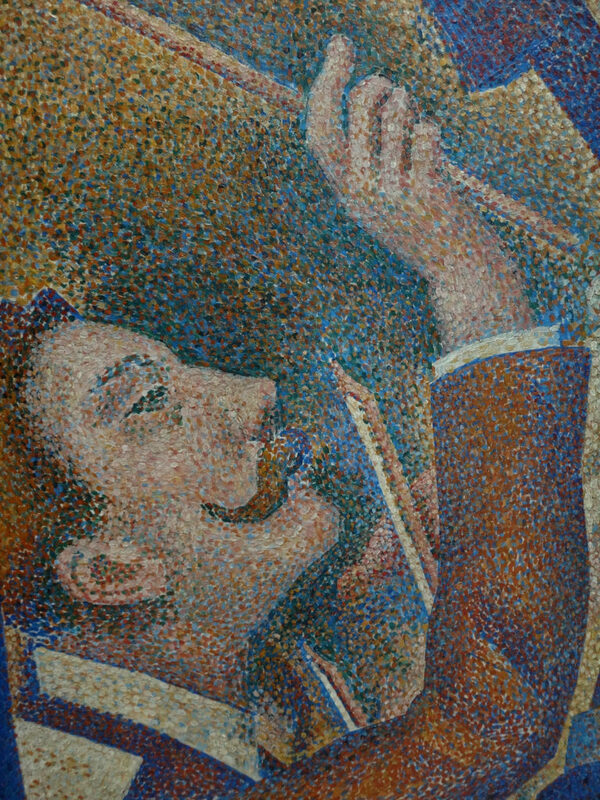 Here are close-ups of two sections of this painting. See what I mean about getting close without being rushed? 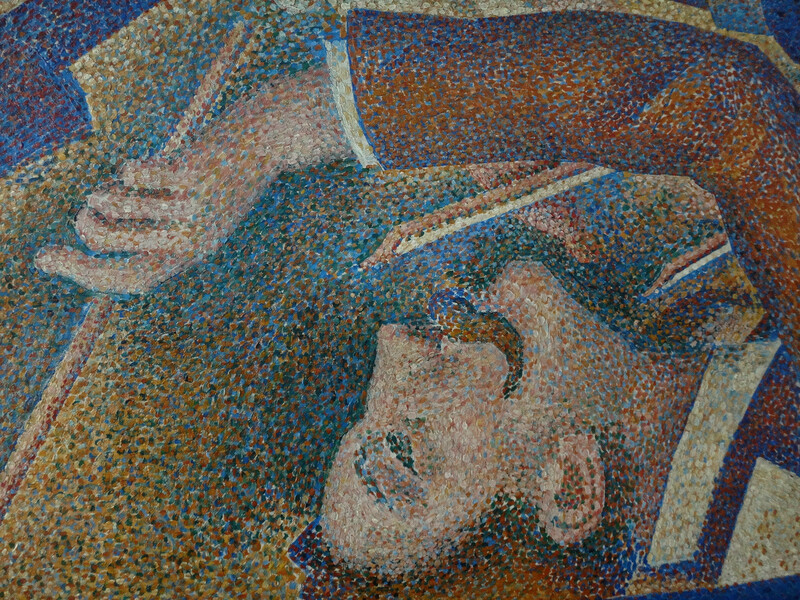 This is a close-up of the lower left corner of Georges Seurat’s La Chahut, 1889. The Kröller-Müller Museum, Otterlo, the Netherlands. 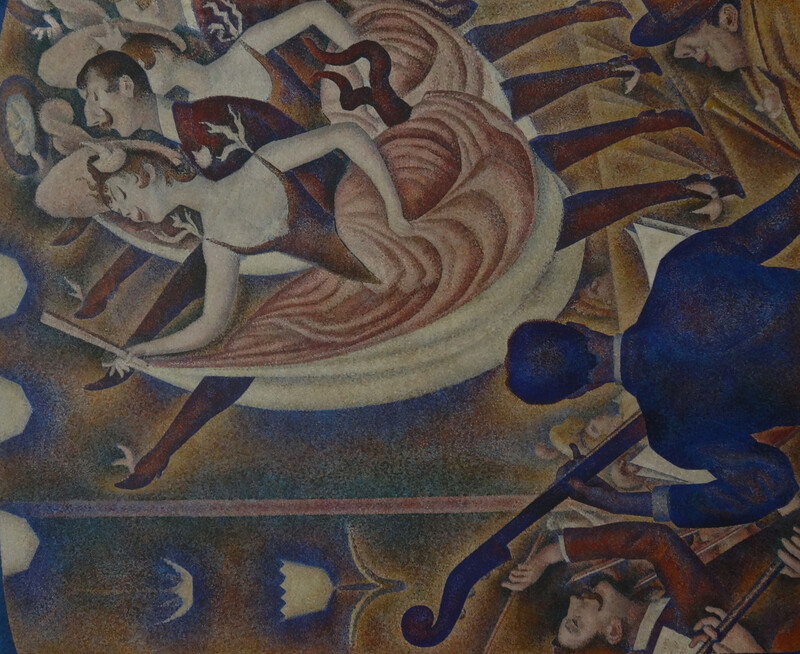 This is a close-up of the lower right corner of Georges Seurat’s La Chahut, 1889. The Kröller-Müller Museum, Otterlo, the Netherlands. 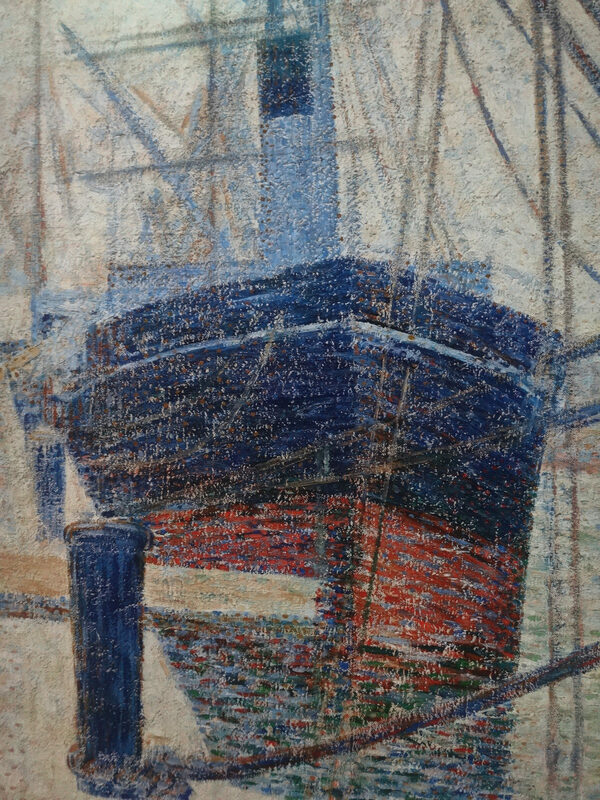 Here’s another side of Georges Seurat with A Corner of the Harbor at Hornfleur, 1886. The Kröller-Müller Museum, Otterlo, the Netherlands. Many more impressionist artists are also represented at the museum. 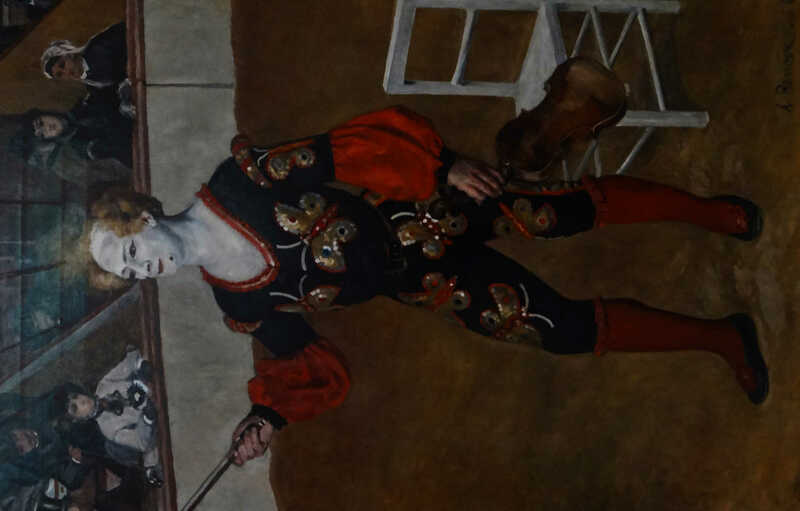 Here are a few of the paintings that attracted me such as this painting by Renoir of the Clown John Prince. 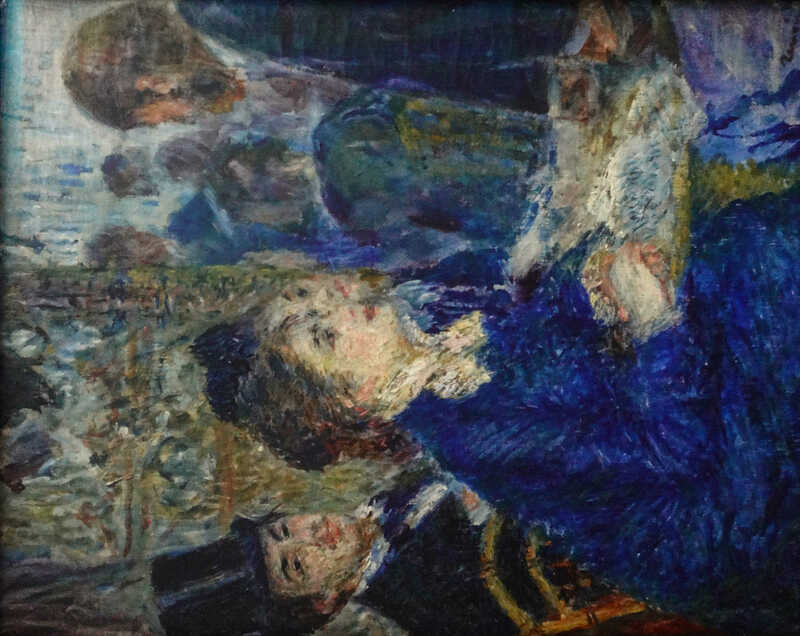 Renoir was commissioned to paint this full length portrait by the owners of the cafe at the Circus d’Hiver in Paris. 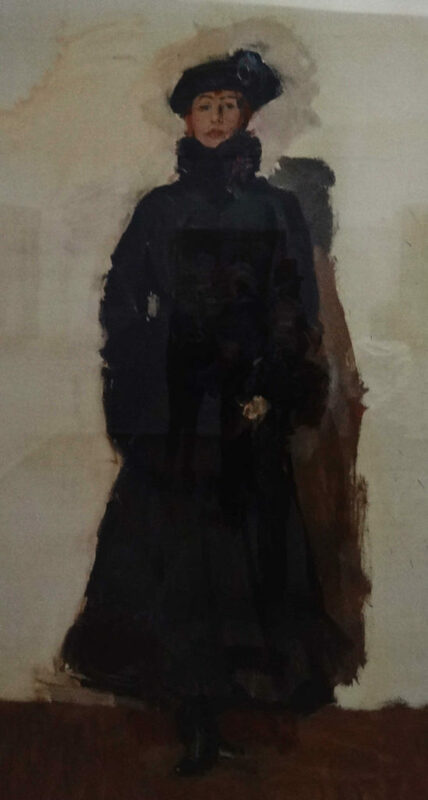 We can usually quickly recognize a Renoir painting, but this one took me by surprise. It’s only of his early portraits created for the owners of a circus. Renoir’s Le Clown, 1868. The Kröller-Müller Museum, Otterlo, the Netherlands. 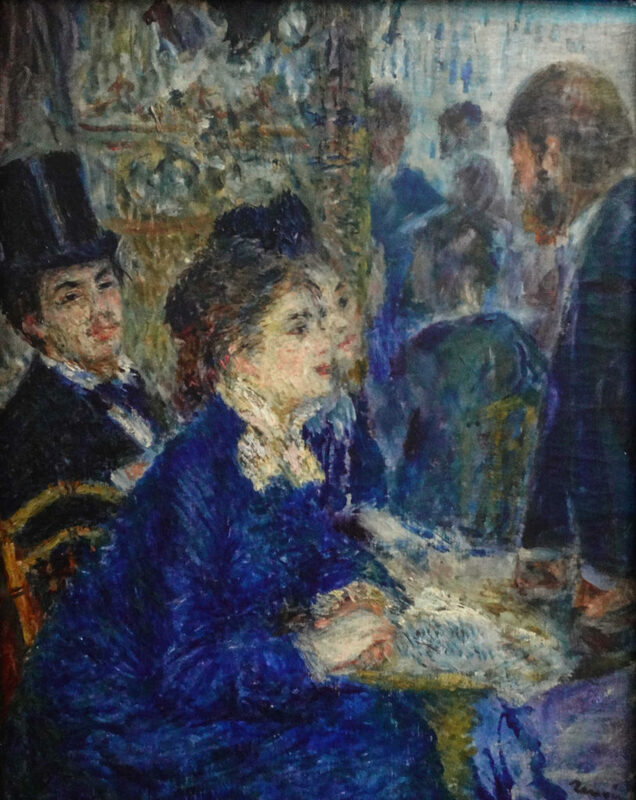 A more traditional Renoir, Au Cafe, 1877. 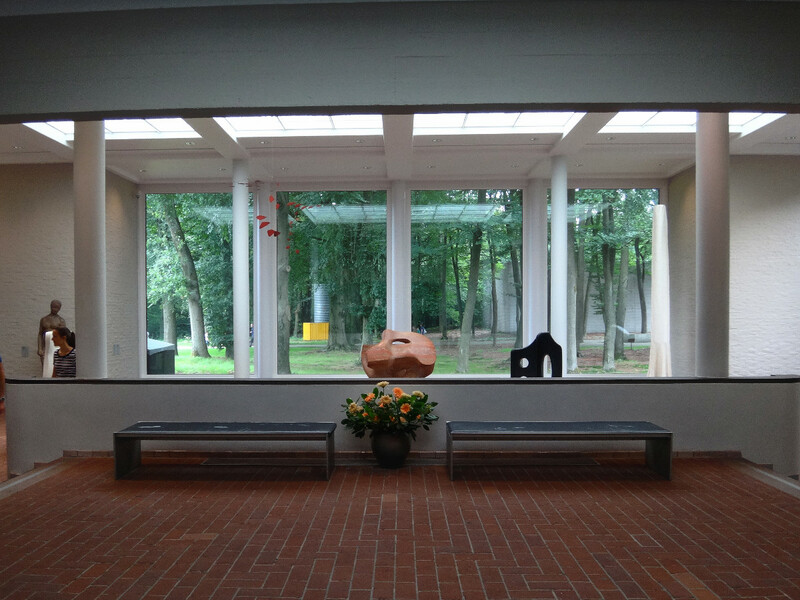 The Kröller-Müller Museum, Otterlo, the Netherlands. 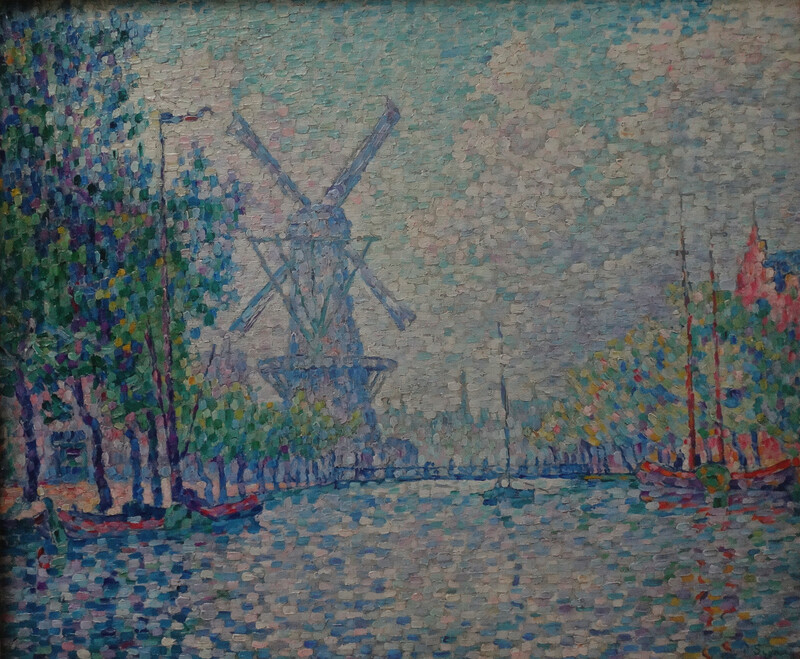 Because I’m in the Netherlands, I was drawn to this Paul Signac painting of Rotterdam, 1906. The Kröller-Müller Museum, Otterlo, the Netherlands. 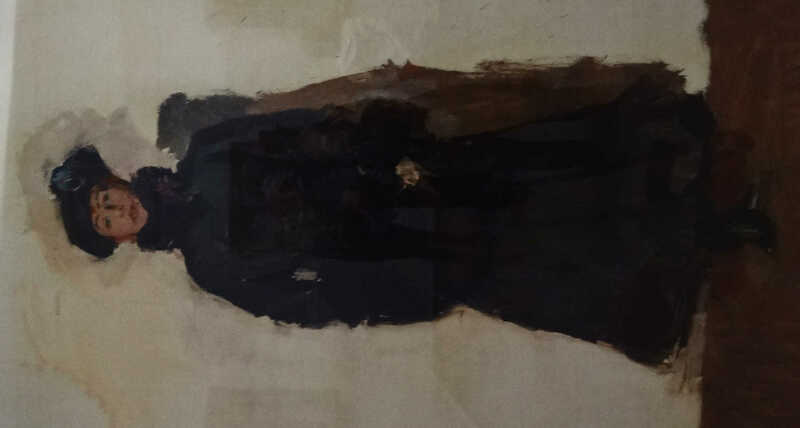 I love this very tall canvas of Mata Hari created by Isaac Israels in 1916. You can feel her power and dignity. I imagine she attracted attention wherever she walked. The Kröller-Müller Museum, Otterlo, the Netherlands. This painting attracted me just because it’s pretty. 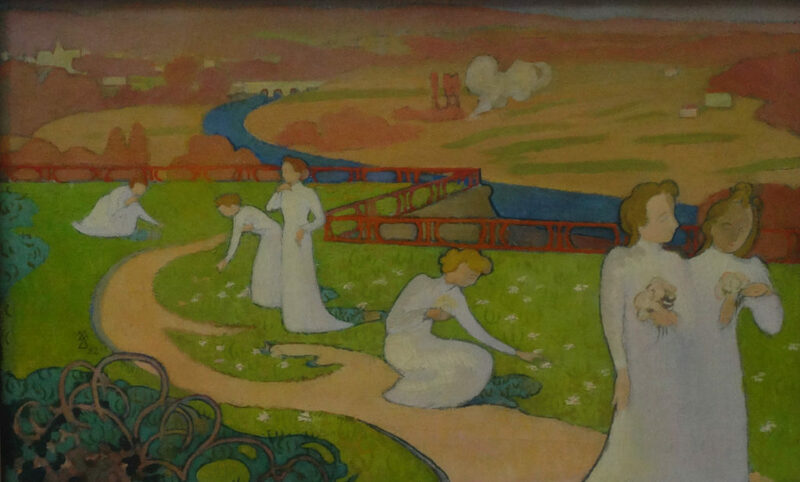 It was created by Maurice Denis for a young girl’s bedroom. 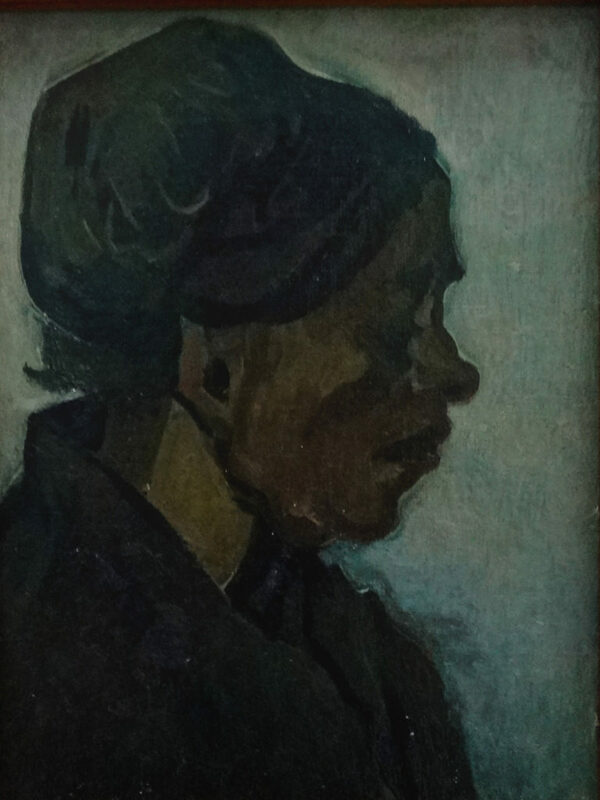 He calls the 1892 painting April. The Kröller-Müller Museum, Otterlo, the Netherlands. Camille Pissaro, whose work is below, is the artist who encouraged Van Gogh to paint with more color and to paint more freely. 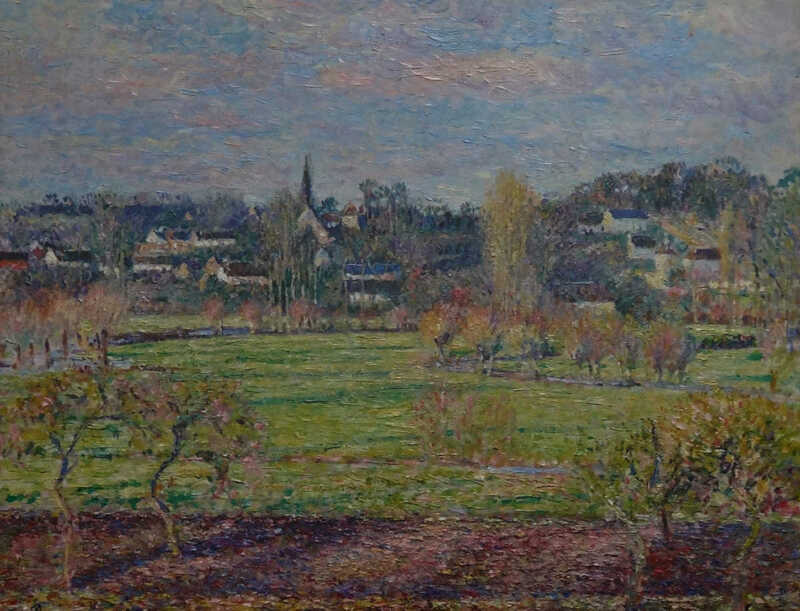 Pissaro was fascinated with the interplay of light and color, according to information provided by the Kroller-Muller Museum. Camille Pissarro’s Bazincourt, 1893. The Kröller-Müller Museum, Otterlo, the Netherlands. 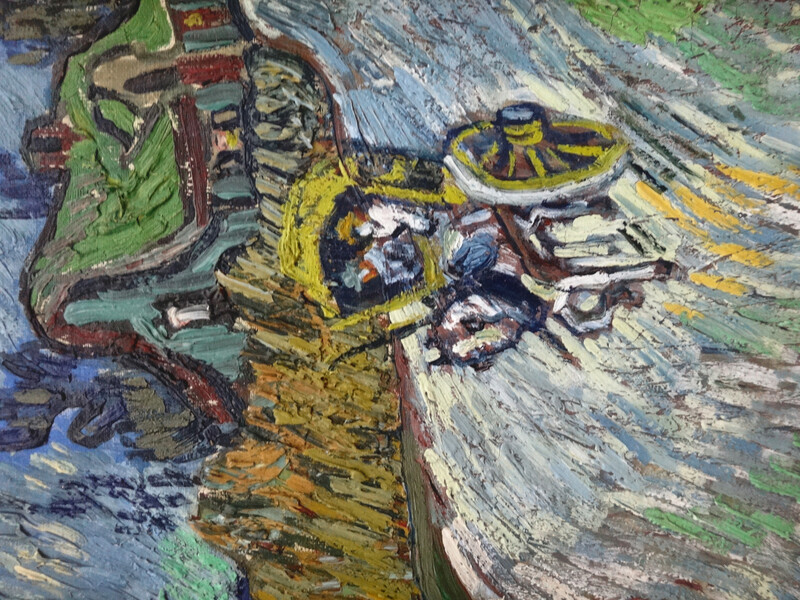 As promised, here are more Van Gogh’s. This painting features both the sun and the moon. Researchers learned that this painting was created on the first day of a new moon so it’s quite possible that both the sun and the moon were in the sky. 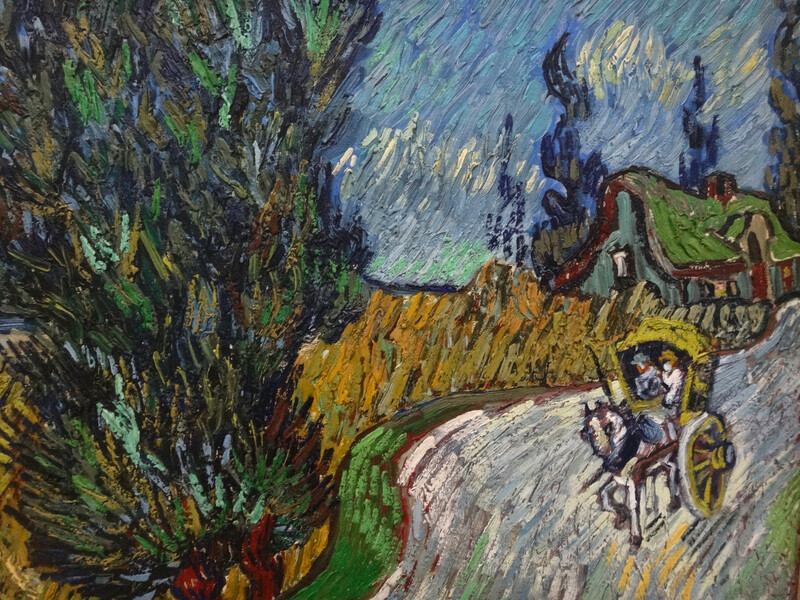 Van Gogh’s Country Road in Provence by Night 1890. The Kröller-Müller Museum, Otterlo, the Netherlands. 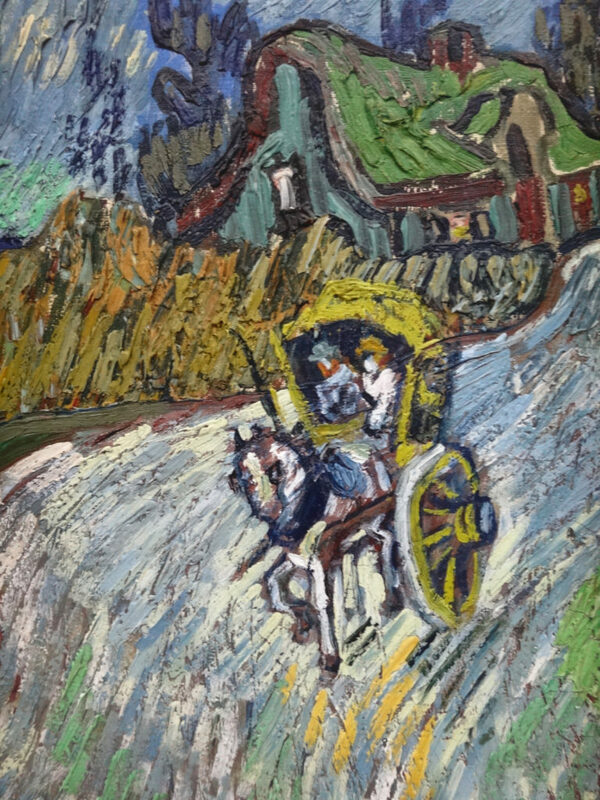 Here is detail of the painting, above, Van Gogh’s Country Road in Provence by Night 1890. The Kröller-Müller Museum, Otterlo, the Netherlands. 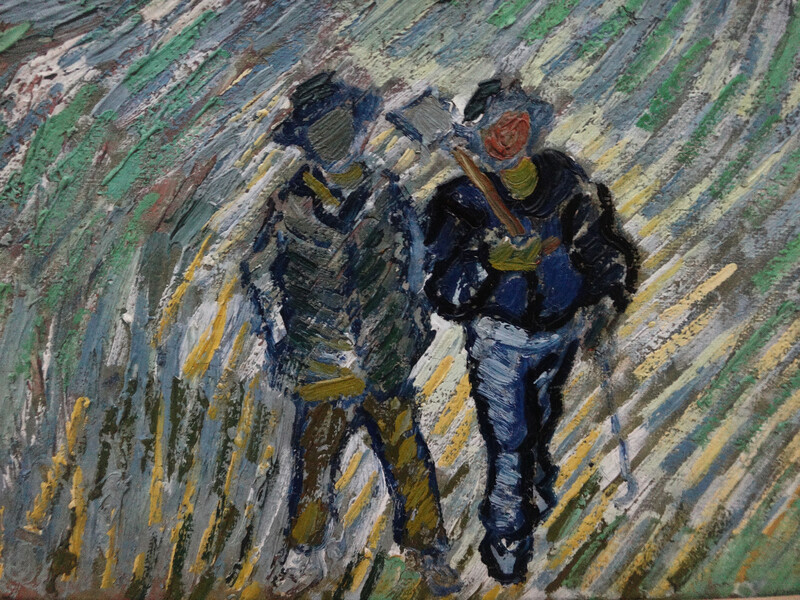 This is one of Van Gogh’s very first oil paintings. 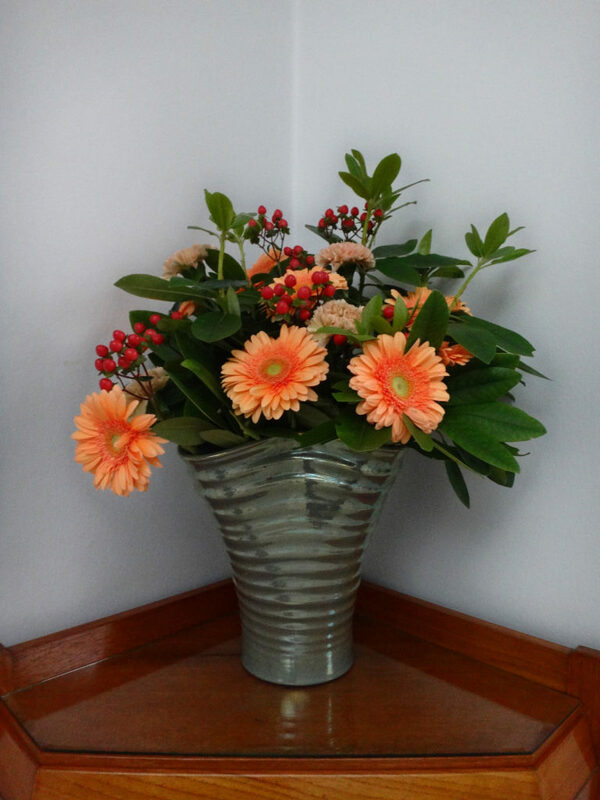 It is asw much an experiment of how to use the medium as it is a still life study of light and shape. 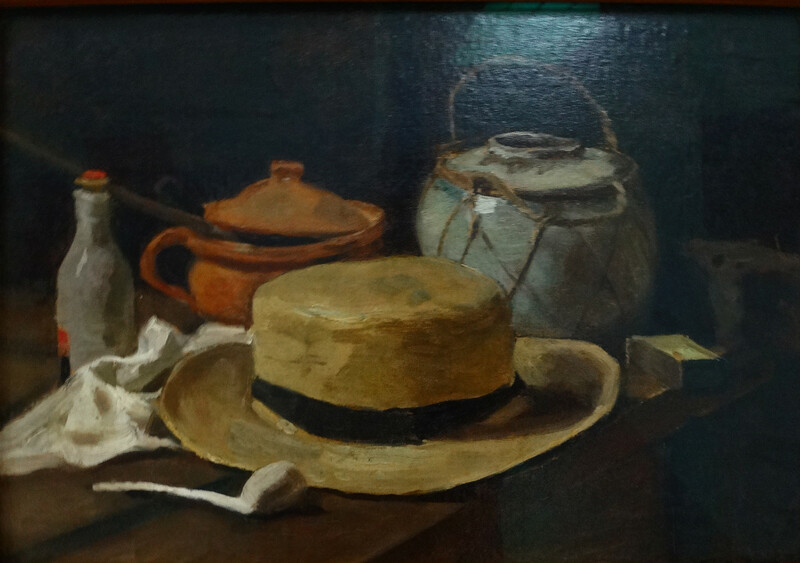 Van Gogh’s Still Life with Straw Hat, 1881. The Kröller-Müller Museum, Otterlo, the Netherlands. Van Gogh’s 4 Sunflowers Gone to Seed, 1887. The Kröller-Müller Museum, Otterlo, the Netherlands. 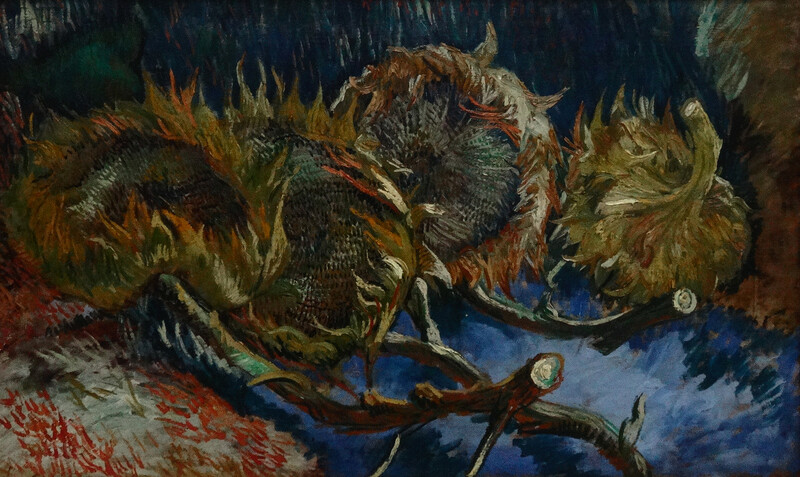 Detail of Van Gogh’s 4 Sunflowers Gone to Seed, 1887. The Kröller-Müller Museum, Otterlo, the Netherlands. 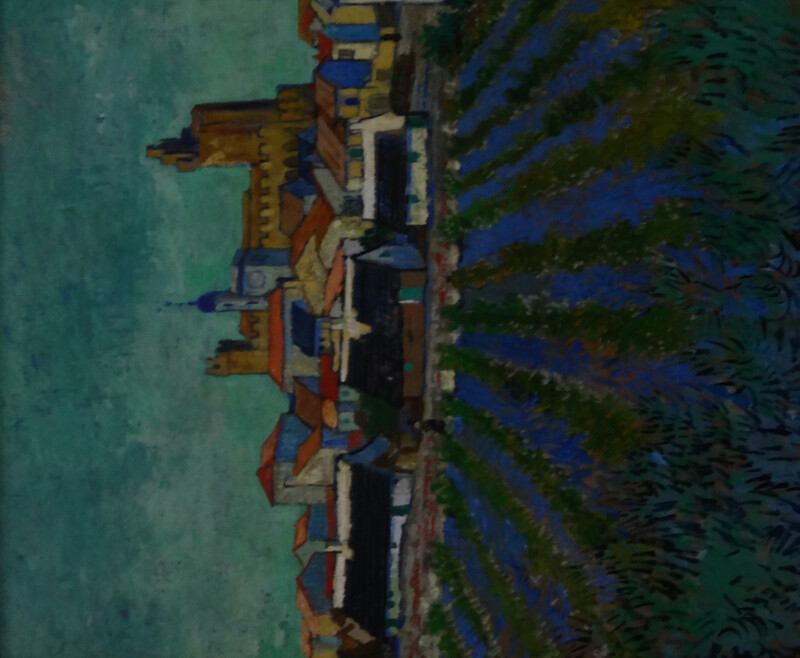 I read that lavender fields only became popular about 100 years ago, yet…..Van Gogh’s Saintes-aries-de-la-Mer, 1888. The Kröller-Müller Museum, Otterlo, the Netherlands. 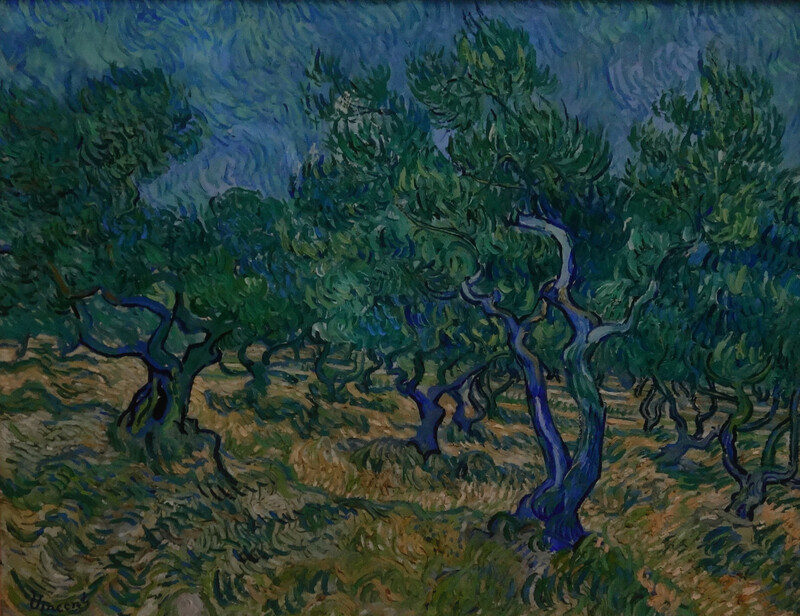 Van Gogh’s Olive Grove, 1889. This reminds me so much of our view out the window during our wonderful two weeks in Provence. The Kröller-Müller Museum, Otterlo, the Netherlands. 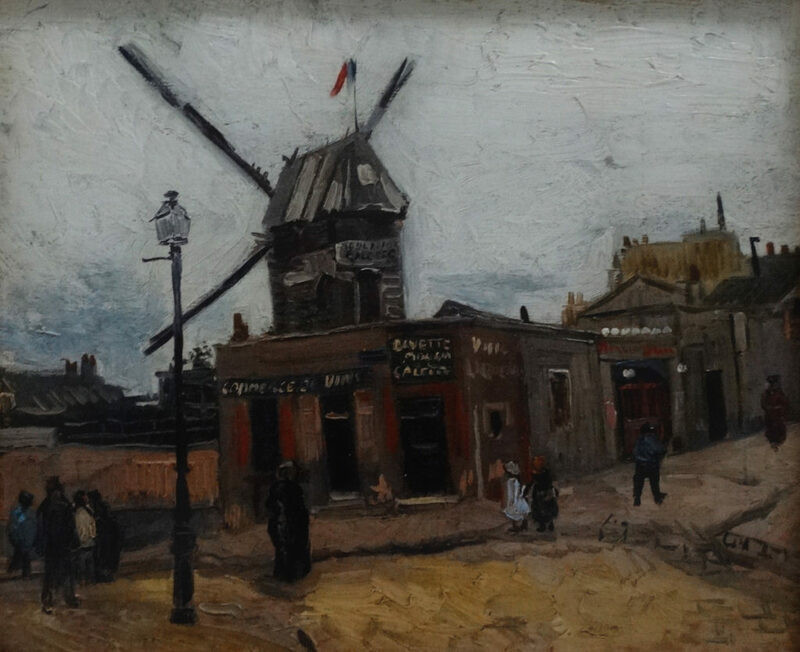 Van Gogh’s Moulin de la Galette, 1886. The Kröller-Müller Museum, Otterlo, the Netherlands. One of my very, very favorite paintings. I bought a print for my home to remind me of this extraordinary painter. Van Gogh’s Bridge at Arles, 1888. The Kröller-Müller Museum, Otterlo, the Netherlands. 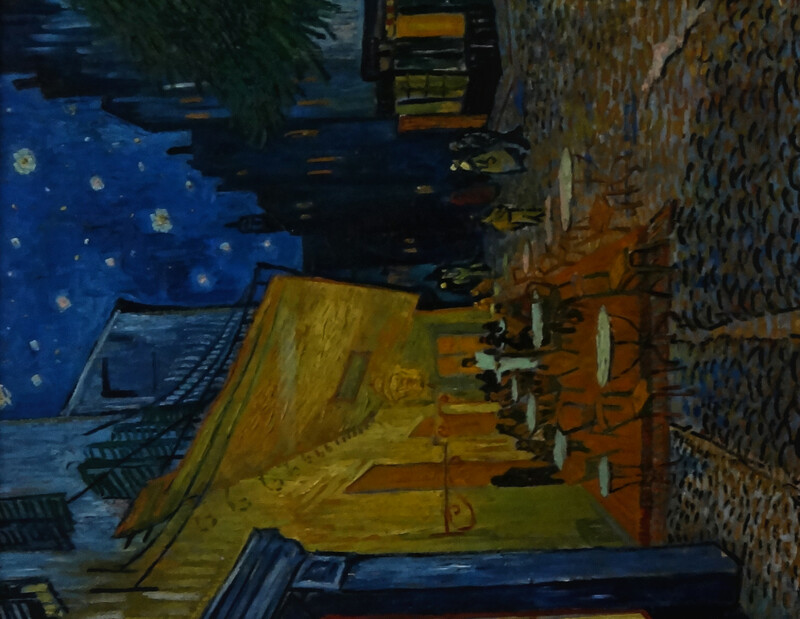 This wildly popular painting of Van Gogh’s Terrace of a Cafe at Night, 1888, is available in purses, napkins, table cloths, mouse pads, calendars….just about anything you can think of at the fine gift shop. The Kröller-Müller Museum, Otterlo, the Netherlands. 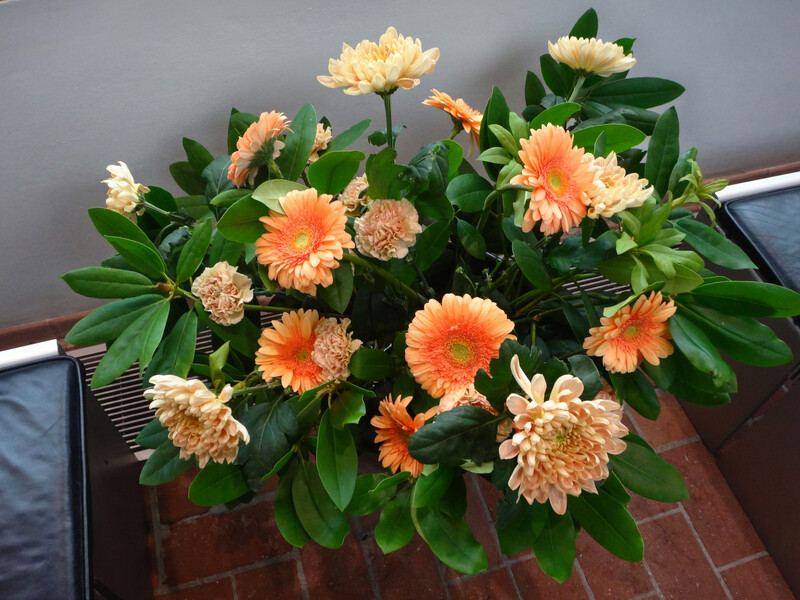 Fresh floral arrangement at the Kröller-Müller Museum, Otterlo, the Netherlands. Make the trip to the Kroller-Muller Museum. It’s well worth the visit and a great break from the frenzy of Amsterdam. There are easy bus and train connections and the drive is interesting. The Kröller-Müller Museum, Otterlo, the Netherlands. 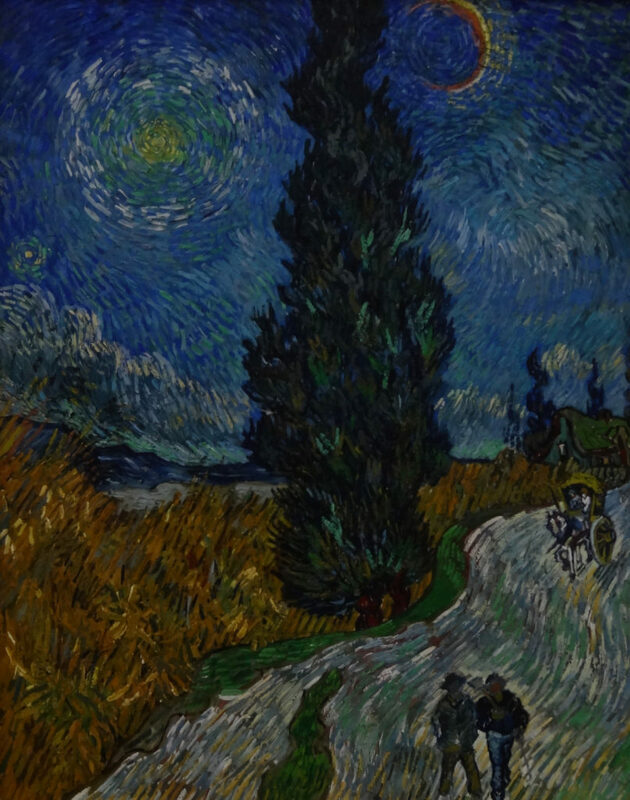 This has nothing to do with this visit to the Kroller-Muller, but you must watch this trailer for the upcoming movie Loving Vincent, just because it is such an original. 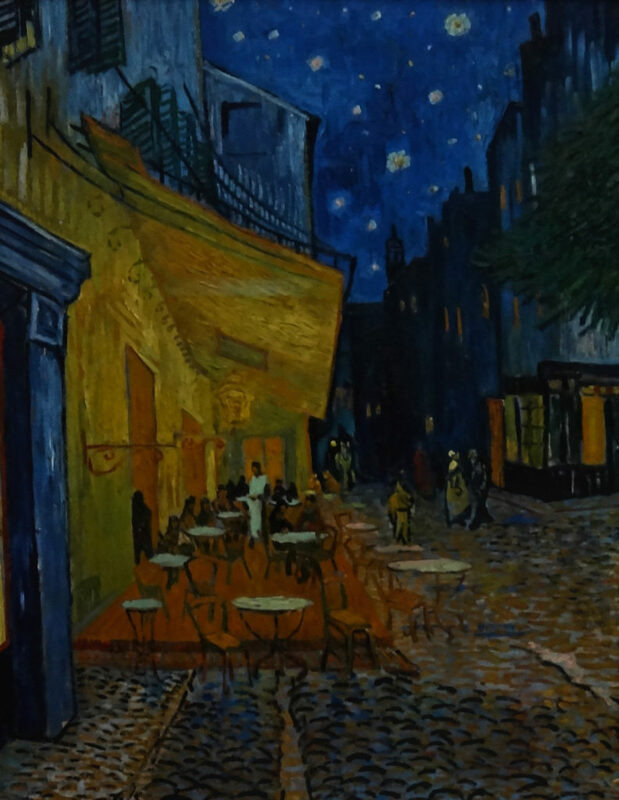 Breakthru Films has taught 100 painters to paint in the style of Vincent for the movie. Cannot wait! 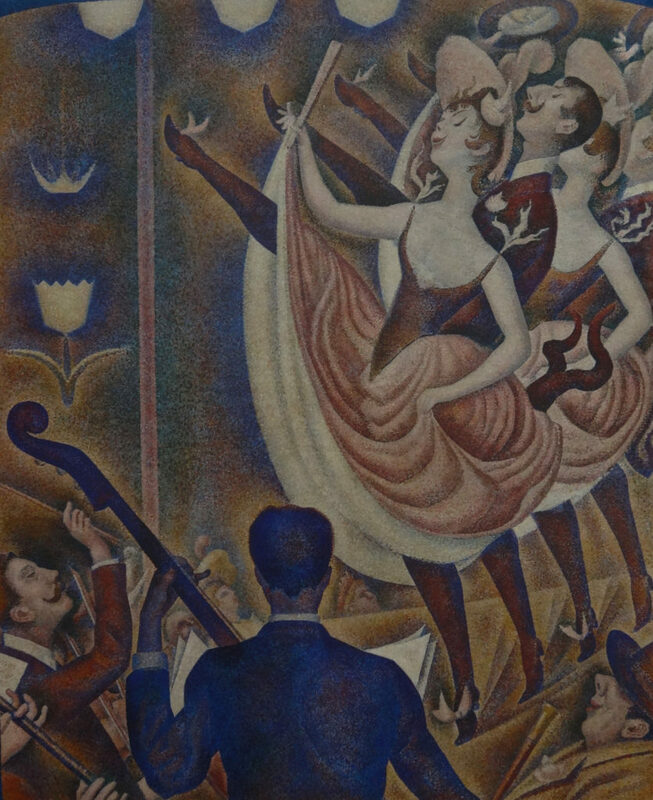 Read more about the world’s first fully painted film here. 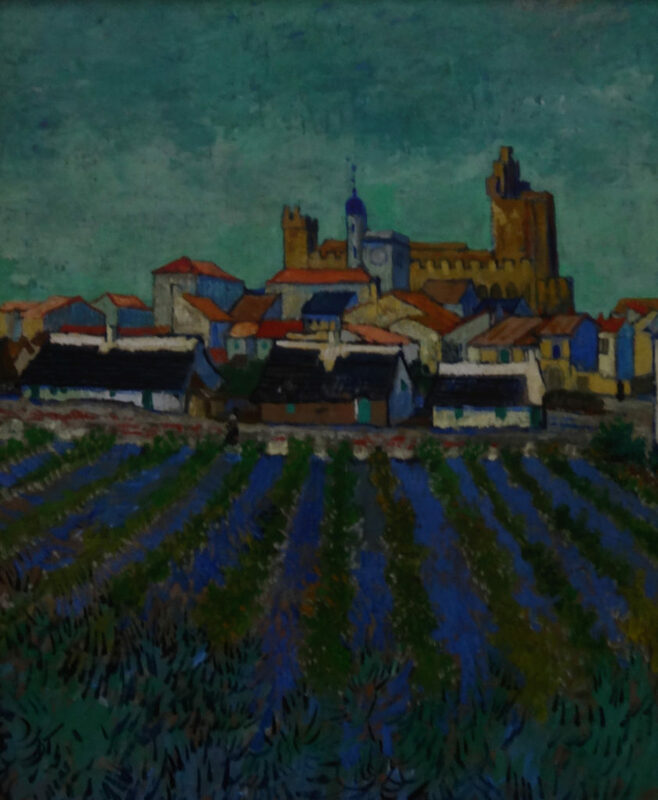 There’s also an interesting video about Van Gogh’s life here from 1Media if you’d like to know more about Vincent’s life.